Before we get into the how-to, let me address the question I know is just burning up inside you: “Why not buttermilk brine a whole turkey?” There are a few reasons. For one, a turkey is always at its tastiest when you break it down, and respect each part as its own thing. Spatchcocking is the best option for a whole bird, but — if my family and friends will let me — I prefer cooking the dark and light meat completely separate from each other, since their target temperatures are a whole 10 degrees apart (65C is best for breast, 76C is what you want for the dark stuff). Pour the water into a sauce pan, along with the salt, sugar, garlic, pepper and bay leaf. Bring everything to a boil, then remove from the heat, stirring to dissolve the sugar and salt. Let the brine cool to room temperature. Once it’s cool, combine it with the buttermilk, then pour the mixture over the turkey breast in a brining bag or small bucket. Cover and refrigerate for 24 hours. Preheat the oven to 190C, remove the turkey from the brine, and let drain on paper towels, blotting to remove excess moisture from the skin. Scatter your fruit in the bottom of a roasting pan or large skillet, place a trivet or rack on top of that, then set the turkey on top. Roast uncovered until the skin is well-browned, covering with foil towards the end if it starts to look dicey. Continue to roast until the thickest part of the breast reads 65C, about 90 minutes to two hours, depending on the size of the bird and your oven. Remove from the oven, and let rest for 15 minutes before carving. 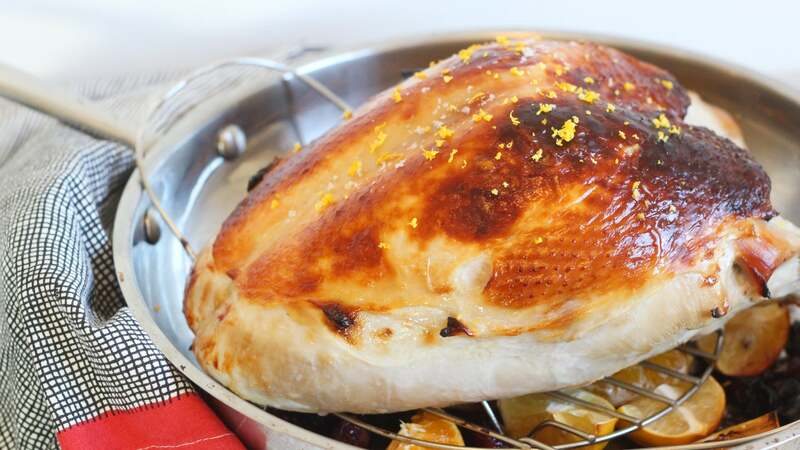 Sprinkle with some Maldon salt and citrus zest, and tuck in to a most tasty celebratory bird.